OK- you’ve got just a few days to go until Valentine’s Day and I’ve thought of a few ideas that could potentially be fun for you and/ or your special one, and could be done up very quickly. I’ll go through the ideas in order, breakfast through dessert; some of the ideas are more vintage than others. And hey- share this with your lover, and maybe they’ll get some good ideas, too. 1. Breakfast: No one gets breakfast-in-bed in my house. It just doesn’t happen. But the night before Valentine’s day, you can set your table so it looks nice and romantic to start the day off on the right foot. Pull out your red, white, silver or gold napkins you use for Christmas and practice your perfect hostess napkin-folding techniques. Here’s a freebie- using a dinner napkin, make yourself a gigantic bow, and instead of a rubber band, slide a napkin ring around the center to form the bow shape. If you don’t have children in the house, walk around a bit longer than usual wearing something less than business attire. It doesn’t have to be traditional lingerie- steal one of his shirts (a la Jane Fonda in Barefoot in the Park), or just keep your towel on from your morning shower. Of course, if you have a beautiful robe or dressing gown and can wander around like you’re Rita Hayworth, why wouldn’t you? 2. Lunch/ Daytime: While everyone else is planning a super-romantic evening of dinner and dancing, continue what you started at breakfast all through the day. This is a not-so-traditional approach, but we’re going for nastalgia here. Before he leaves in the morning, tuck a hand-made Valentine’s card into his wallet or lunch. Think of the cheap little cardboard cards you used to give out in Elementary school, and make something in that vein. It will be tempting to go overboard on the glitter and glue (like really, really tempting) but try to refrain, for his sake. You can easily find clip art on line for images and phrases that are vintage-y. 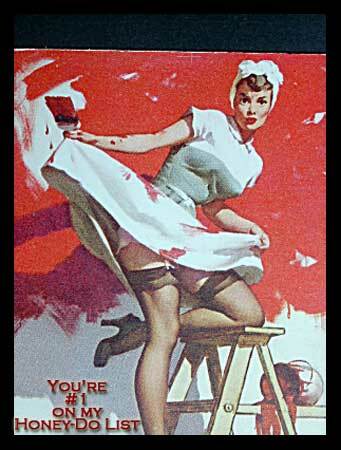 I’m putting up a few that I designed using vintage pin-up girls. 3. Early Evening: At the end of the work day, express your love in the best way possible by doing something nice for your partner- any small chore that they typically do from day-to-day, but probably don’t love. Take care of it yourself so they don’t have to. If that’s not doable, offer a pre-dinner foot rub or shoulder massage. Mix an old school cocktail- check out the recipes I found here: Vintage Valentine’s Day Cocktails. And here are some virgin mocktail options: Virgin Mocktails. I’m Head Over Heels for You! 4. Dinner: A true vintage woman would make a multi-course meal, served on the finest china, and wear a fresh gown with pearls to the table. As a working woman, I offer a compromise. Order dinner from a restaurant that is beloved by both of you that also offers carry-out. You can still serve it on your finest china. Instead of a gown with pearls, make yourself a retro apron for this special occasion. Using the pattern for your circle skirt, cut out only a half-circle rather than a full circle so it will fit around your front. Cut a long, straight band for your waistband- 4-5″ wide x 50″ long or so. Center it on your half-circle so the two ends are free to tie in the back. To decorate, patch on some heart cut-outs; purchase some of those paper doilies and spray paint or sponge paint around them onto your fabric to make a pretty pattern; attach some lace trim to the bottom hem; use a thin or semi-transparent fabric and don’t wear too much beneath it. Definitely wear heels, if you can. Can I Sweep You Off Your Feet? Have some topics for conversation ready to go to keep things lively. Seduction goes far beyond seeing, smelling, and tasting; seduce his mind as well by asking about the book he’s reading, what he thinks about world politics, and offering your opinion on whatever interests you- even healthy debates can be very… stimulating. Be flexible- hopefully your partner is not a total dud, and has some things planned as well. Go with the flow for the evening. If those plans include eating out (how wonderful! ), go for the gown with pearls after all. Pull together a vintage-inspired lingerie set including garter belts and stockings. Even if your partner doesn’t know what you’re wearing underneath it all, you will feel a thousand times sexier. Order dessert. Duh. Maybe you’ll work it off later. Draw me like on of your French girls, Jack. 5. I’m not going to tell you what to do after dessert. That’s not my business, and a lady never tells. Terrific post, I will definitely do a few special somethings! The kiddos will get to pitch in as well, heaven grant me patience.